Navigate to ~/ by running cd ~/, and then hit ls -a. The -a option forces the system to output all files, including those that start with a period .. You will see a .bashrc file. The .bashrc file defines your terminal configuration. For example, it will set your shell prompt. The .bashrc file is run each time you open a terminal. As a general rule of thumb, if you want to make a change to your terminal settings you will make a change in your .bashrc file, so it is good to familiarise yourself with it. 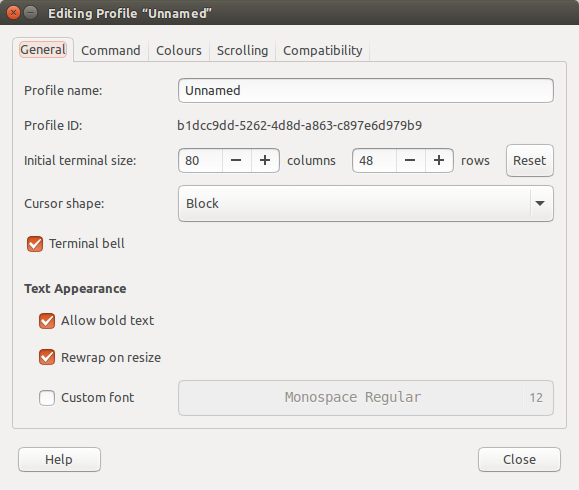 Open your file by running gedit .bashrc (or use another text editor if you prefer). Take a look around, we will be using it later! You should create terminal aliases so that you don't have to write out the same commands over and over again. The built in ls and cd commands are already pretty short, but you should create aliases for anything else that you use frequently. I use gc as an alias for git commit, gb as an alias for git branch and sc as an alias for scrapy crawl. Your bashrc file will load automatically when you open a new terminal, but if you want your aliases to work in the terminal that you already have open you will need to run source ~/.bashrc. You can then navigate up X directories by running the command up X. X can take any numeric value. It is useful to know the shortcuts for opening and closing terminal windows - we don't want to use a mouse! In Ubuntu, use CTRL + ALT + T to open a new terminal, and use CTRL + SHIFT + W to close your terminal window.